Running Past has covered several of the streams that eventually amalgamate to form the River Pool in Beckenham’s Cator Park – all had their sources in the Great North Wood which sits on one of South London’s most prominent pieces of high ground – stretching from South Norwood Hill, through the present Crystal Palace, Sydenham Hill and Forest Hill – to date these have included several without surviving names, those that I have called Pissarro’s Stream, Wells Park Stream and Adams’ Rill. This lack of names is more than made up for by a quartet of options for this waterway – known variously as Boundary Stream, Boundary Ditch, the River Willmore and Shire Ditch. Regular readers of Running Past will know I am partial to using ‘Ditch’ – it is common in the Quaggy catchment. However, it seems out of place here and given the significance of this watercourse, I think that it deserves ‘river’ status. 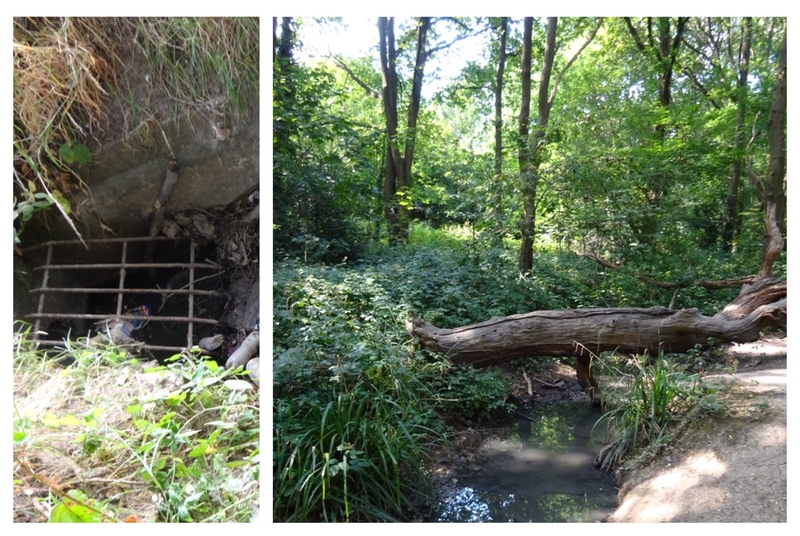 Rivers and streams often form the boundaries between parishes, wards districts and counties – as was covered in a post on the Quaggy catchment on Border Ditch which is part of the boundary between Lewisham and Bromley. 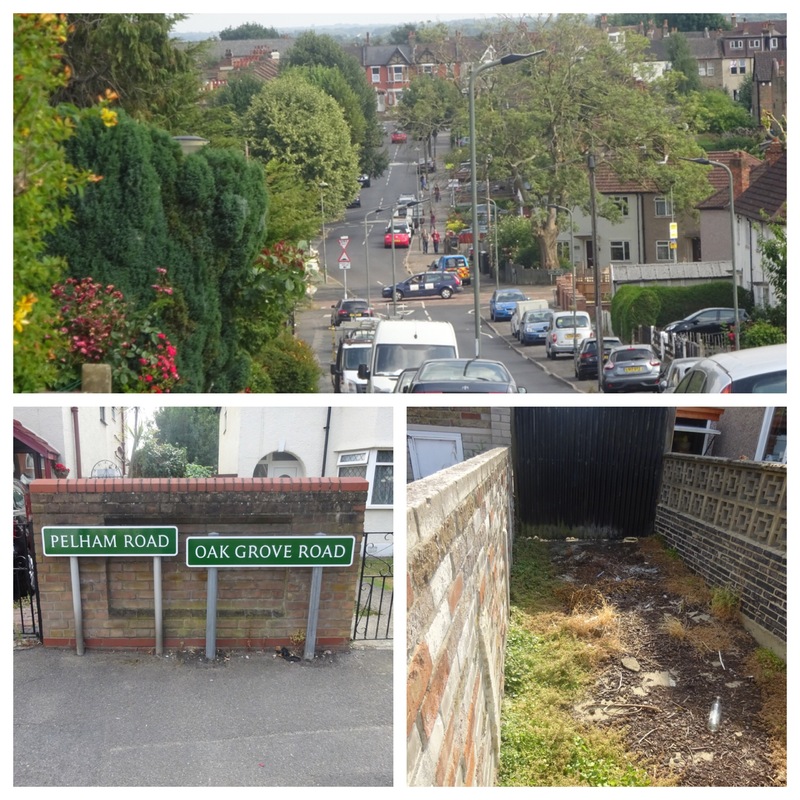 The boundary that the Willmore is used for refers to is a ‘lost’ one between Surrey and Kent (to the east), and later the frontier between Municipal Borough of Beckenham and Penge Urban District Council (UDC). As a boundary it was there when John Roque mapped Surrey in 1762 (above) marking the edge of the surveyed land. 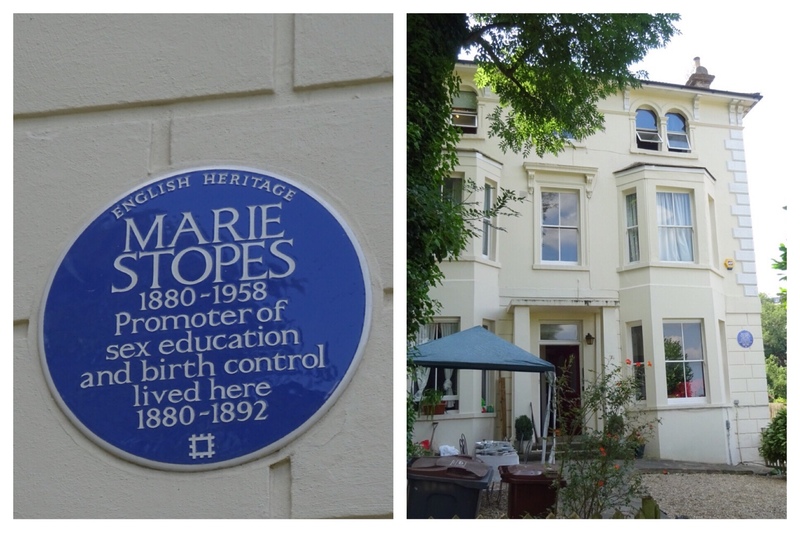 Penge has had a strange history in terms of boundaries – for hundreds of years it had been an isolated part of the parish of Battersea, itself part of the Hundred of Brixton. In the second half of the 19th century the Metropolis Act brought it together with Lewisham and it was run by the Board of Guardians – this was a cross boundary arrangement with Lewisham being in Kent and Penge in Surrey. After the London local government re-organisation that came into force in 1965, Penge UDC was merged with its next door neighbour, Beckenham, over the Willmore (along with the Municipal Borough of Bromley, Orpington Urban District and the Chislehurst bit of Chislehurst and Sidcup Urban District.) to form the London Borough of Bromley. The main sources of the Willmore are in the high ground above South Norwood Lake. 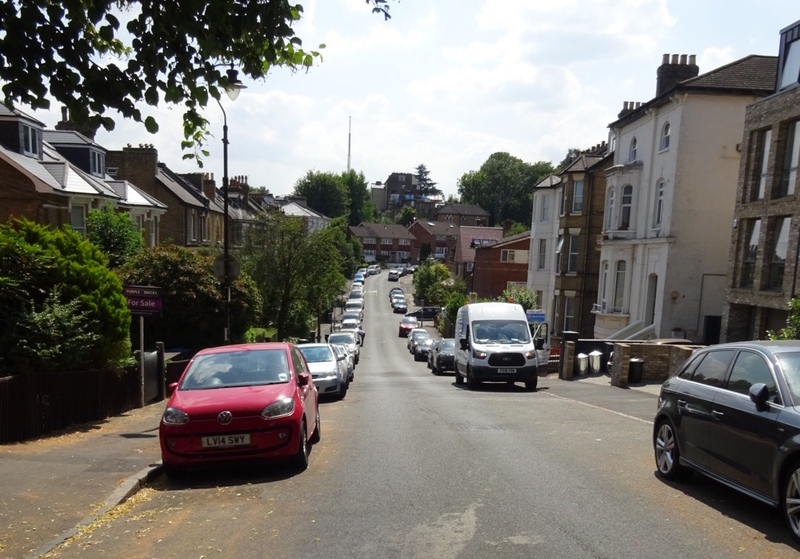 The steep hillside coming down from the ridge that continues on from Sydenham Hill and Anerley Hill, on top of which once sat the Crystal Palace saw numerous springs where the geology changes and the gravel meets the London Clay beneath. The hillside below them is gently serrated with small valleys gouged out by fluvial activity as water tumbled down towards lower levels. These valleys are clear both on the ground, despite the volume of housing that clings to the hillside, as well as on Ordnance Survey maps where there are upward pointing notches in the contour lines. 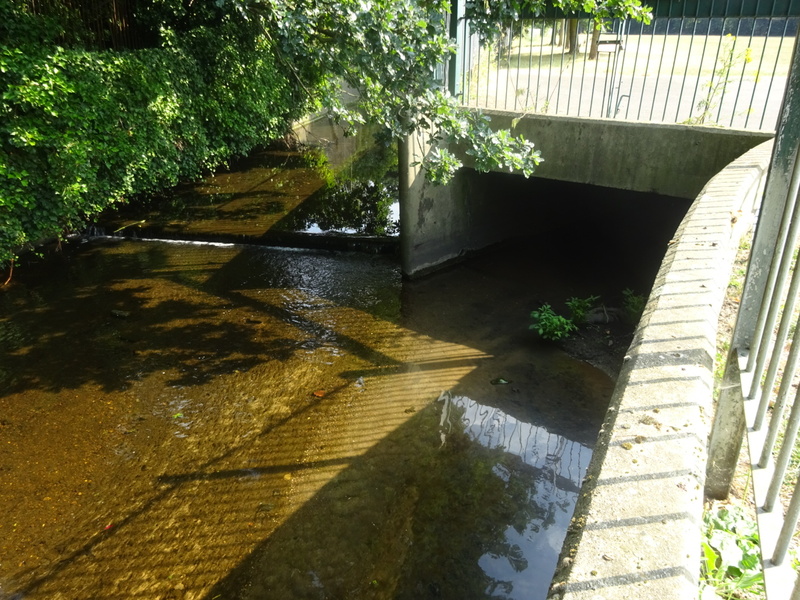 Some of the flows are no longer visible either because they are no longer flowing due to changes in the water table or because they have been culverted. The 1863 surveyed map above shows some evidence of the flows. The reality on the ground now is a little harder to work out due to the extent to which, first the Croydon Canal , which opened in 1809, and its successor along much of the course 30 years later, the London and Croydon Railway, played havoc with the natural lines of the landscape, changing contour lines and flows. 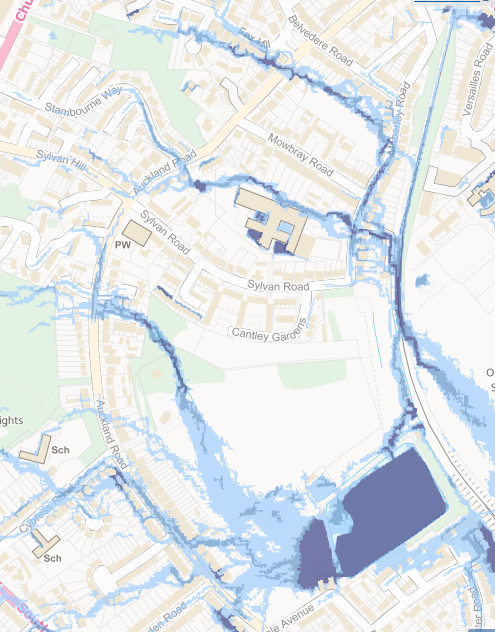 Environment Agency 100 year flood risk map, whilst relating to surface water is helpful in tracking former streams as storm flows will often follow the courses of former or hidden streams due to the small valleys that have been created. 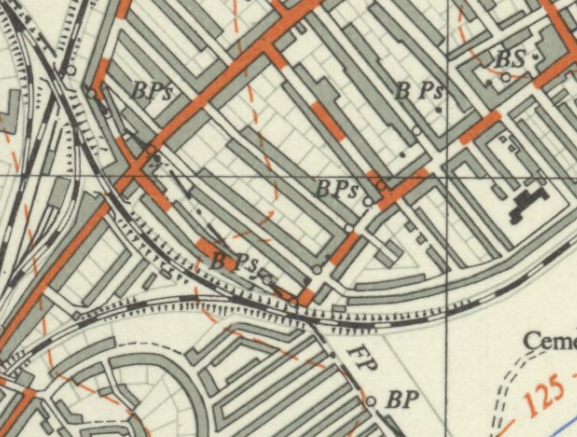 There are two main groups of these the northerly streams ones which coalesce around Maberley Road and the Auckland Rise group which would have combined in what is now South Norwood Lake and Grounds, along with a southerly one originating around Goat House. The exact sources of the streams forming this branch are not that obvious, development has made exploration of the upper slopes of the hill difficult. In any case, changes in the water table have probably meant that they are no longer flowing,. However, the multiple switchbacks caused by streams eroding the hillside are clear on Auckland Road, one around Fox Hill, the other in Stambourne Way (below). Originally gravity would have probably suggested that the course was a downhill one – there are hints of this on the Environment Agency map. However, the downward flow would have been blocked by the route of the Croydon Canal. 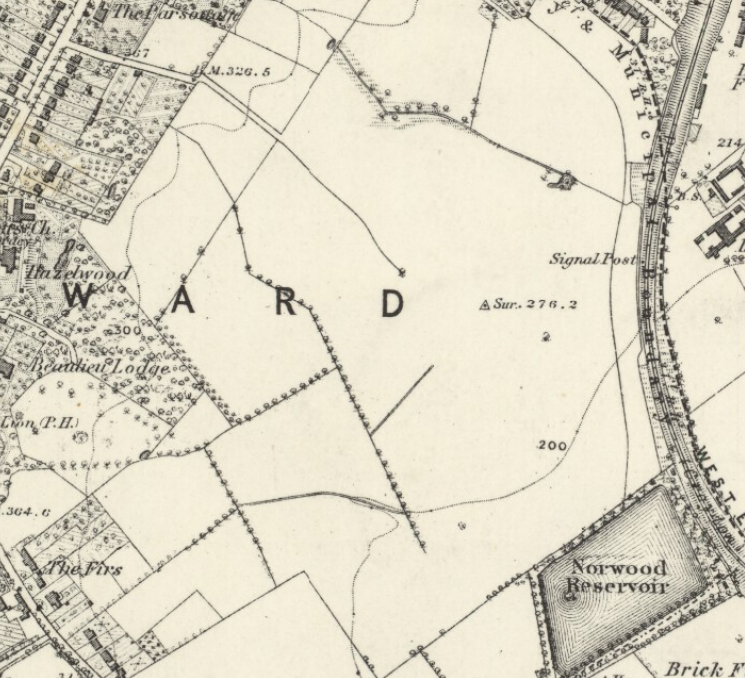 It is quite likely that its engineers wanted to use the streams to provide water for the reservoir that is now South Norwood Lake which was used to provide water for the canal. This would probably explain this unexpected dog-leg to a confluence around the Harris Academy site and a flow onto the Lake. The arrival of steam, 30 years after the canal no doubt confused matters further. Close to the Maberley Road entrance of South Norwood Lake and Grounds there is what appears to be a seasonal stream, in the incredibly dry summer of 2018 there was, unsurprisingly, a lack of water. The occasional watercourse seems to peter out just before it would have entered the Lake. Of the three streams that once flowed about ground there is little evidence for two of them other than depressions in roads marking their presumably former existence, certainly nothing flowing in the driest summer for 44 years. However, the third is most definitely flowing. The upper reaches while clear in terms of contours aren’t on the ground – a long slog up the steep, winding road through the Auckland Rise estate to a small bit of woodland failed to produce any of the obvious signs of water that the notched contours suggested. Although there were a couple of rather attractive wooden owls an overgrown picnic areas. 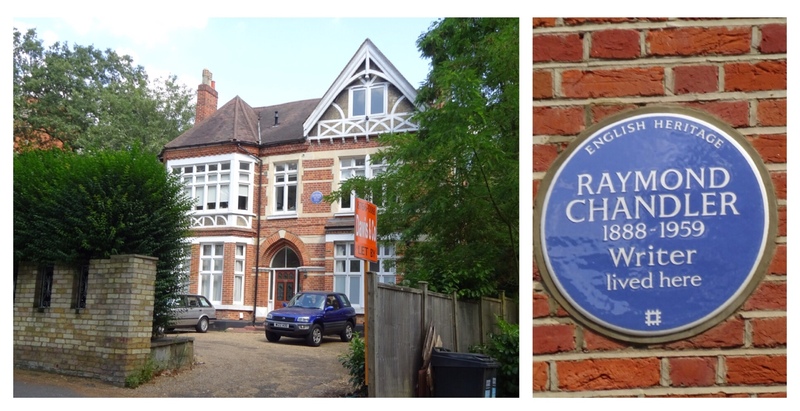 The stream would have flowed past the childhood home of the crime writer Raymond Chandler, which is remembered with a blue plaque – he had been gone from there for almost 30 years before he published his first novel ‘The Big Sleep’ in 1939. The course emerges from Auckland Close (where there is no hint of the stream) out into some bramble dominated woodland, not some residual part of the Great North Wood as it isn’t marked on the Ordnance Survey map above. It doesn’t seem to have a name but the nascent stream emerges, finding a way through the choked woodland floor to the edge of some school playing fields abutting South Norwood Country Park before disappearing into a rudimentary screen – presumably then going, submerged, into the Lake. 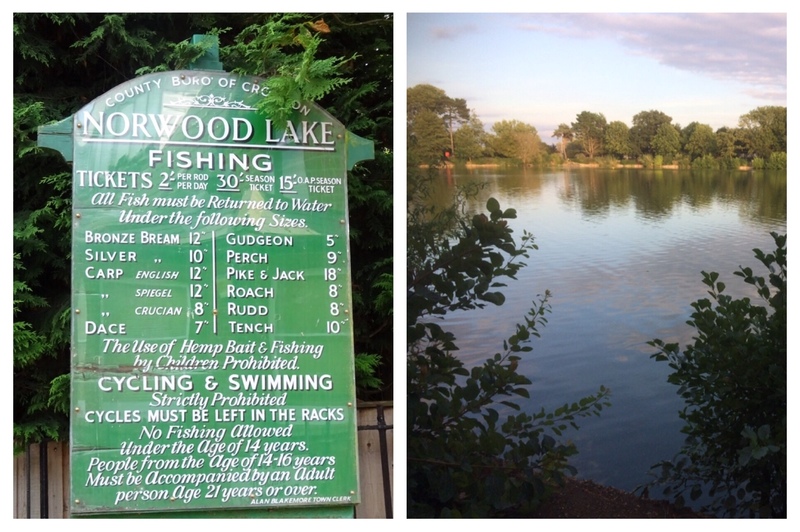 South Norwood Lake would have been the man-made confluence of all these streams – a reservoir for water needed to keep up levels in the 28 sets of locks in the Croydon Canal. It is a pleasant park, with an elegant cricket ground – the Lake is home to a lot of wildfowl and plenty of spots for fishing. The latter has a long history here – there is a beautifully preserved pre-decimal sign indicating fees – which had risen a little by the time of writing. John Roque’s 1672 map of Surrey (above) suggests a branch emanating from ‘Goat House’. In terms of location this would have been around the location of the current major bridge over the railway, around 250 metres from Norwood Junction. There was for a while a pub of the name next to the bridge. 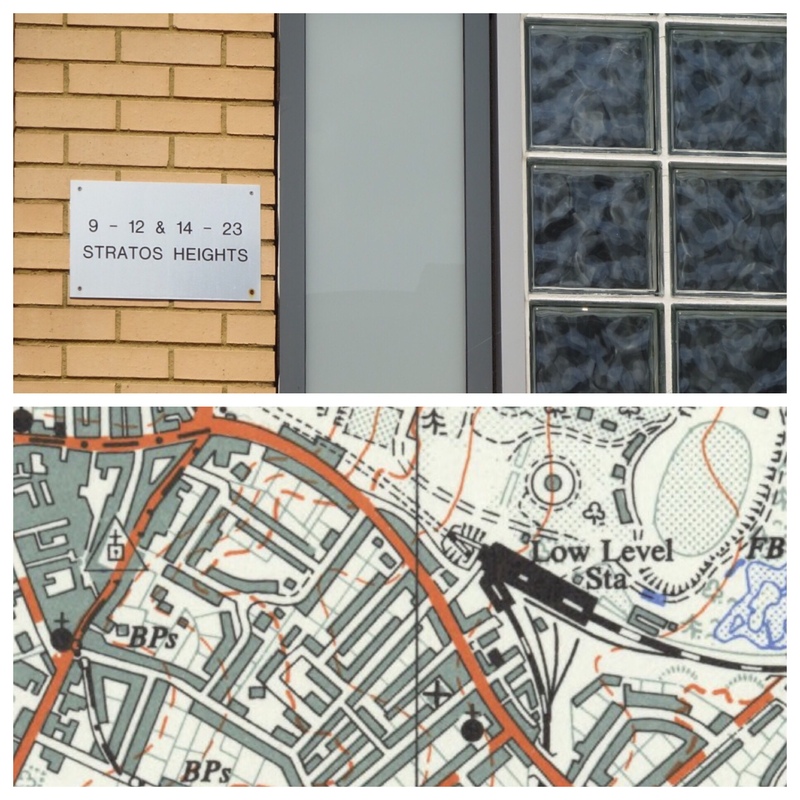 The route on a 1960s OS map is much clearer than on the ground – there were boundary markers at the junction of Thomsett and Wheathill Raods with Marlow Road and then a little way up Cambridge Road. As these are broadly the same as the contour notches this was probably the route of the branch. Like its northern counterparts, the railway played havoc with the route, as the 1960s Ordnance Survey map below shows. The outflow appears to be along the northern side of the Lake, where in the dry summer of 2018 a trickle of water was heading north-eastwards. It then gets disturbed by the railway (formerly canal) again, along with another line from coming into Crystal Palace from Birkbeck station and Beckenham Junction beyond. 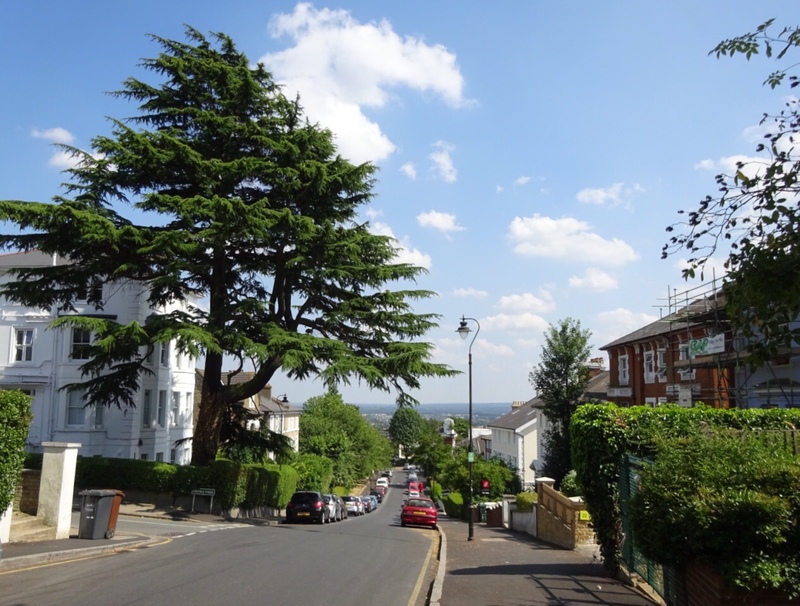 The land either side of Croydon Road is fairly flat, although gently failing away to the east, so an exact route is hard to be sure of. But it probably crosses Selby Road running through the South Penge Park estate crossing Croydon Road near the sad site of a boarded up pub, the Mitre, which closed in March 2018, a recent refurbishment seemingly having failed to attract sufficient new drinkers. The course eastwards was probably originally crossing Tremaine and Samos Roads. The confluence with the branch from Goat House would have been around here. A slight depression becomes obvious in Marlow Road, while there are no obvious signs of water rushing beneath manhole covers (it was very dry though) The route beyond the small Willmore-cut depression in Elmers End Road , is clear because until the mid-1960s the Willmore was flowing above ground at this point. 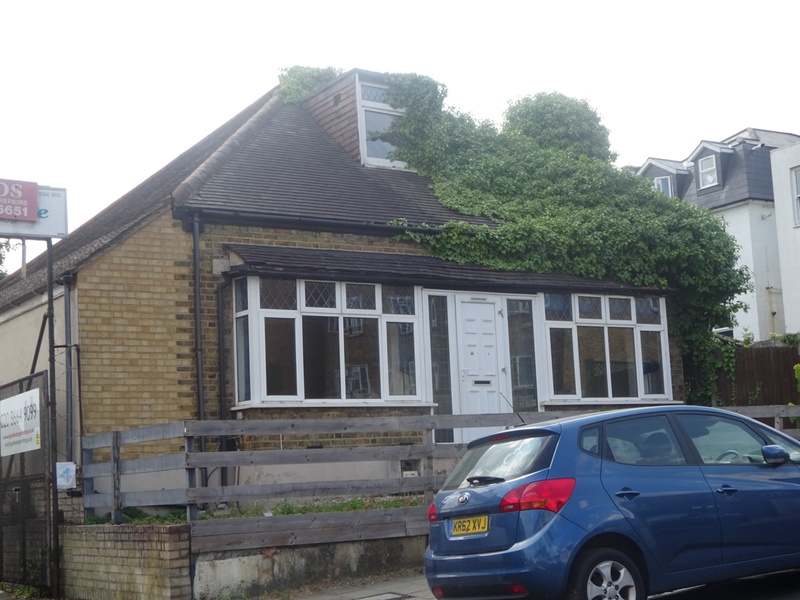 It squeezed between gardens for Ravenscroft Road and Chesham Road. It is obvious from both the blue of the water and the coterminous black boundary dots on the early 1960s Ordnance Survey map. A slight diversion is needed at this point as we are now very much in Penge here; Penge to the fluvial flâneur of a certain age, will always gave a grizzly association – the ‘Penge Bungalow Murders.’ Fortunately, these were fictional rather than actual homicides and were to the starting point of the career of ‘Rumpole of the Bailey’, wonderfully played by Leo McKern. 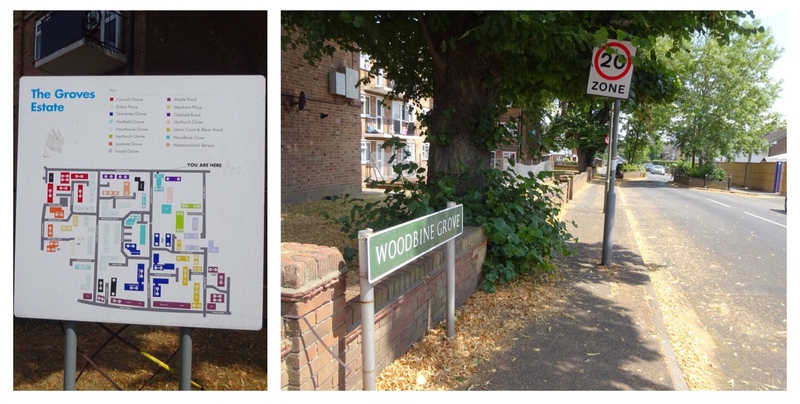 In the streets of Penge, bungalows are hard to find – I would love to think that this is John Mortimer’s inspiration about a 150 metres off course. We digress though, and ‘she who must be obeyed,’ in this case the River Willmore, must be returned to. The valley crossing the main downward hill from Crystal Palace towards Elmers End at right angles becomes a little more pronounced here. There are a couple of bridges over the former stream which are obvious – the first reflects different street names in once different boroughs either side of the bridge, the second while plainer fails to hide the concrete casing that the Willmore now has to lurk beneath squeezing between the houses. . 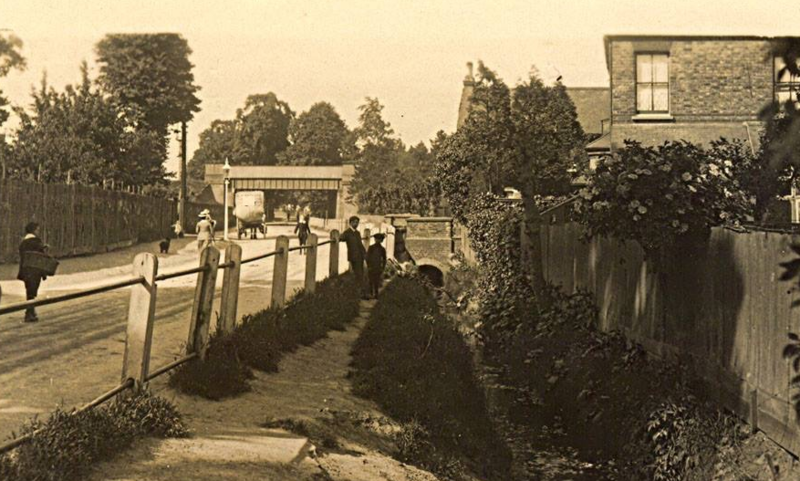 In 1894 the Lewisham and Penge Board of Works asked their counterparts in Beckenham to help pay for improvement works to what they referred to as Boundary Ditch as it was in places insufficient to deal with the volume of water entering from both parishes. The culverting of the river seems to have started in late 1965 as it was promised in a statement by a Minister in April 1965. 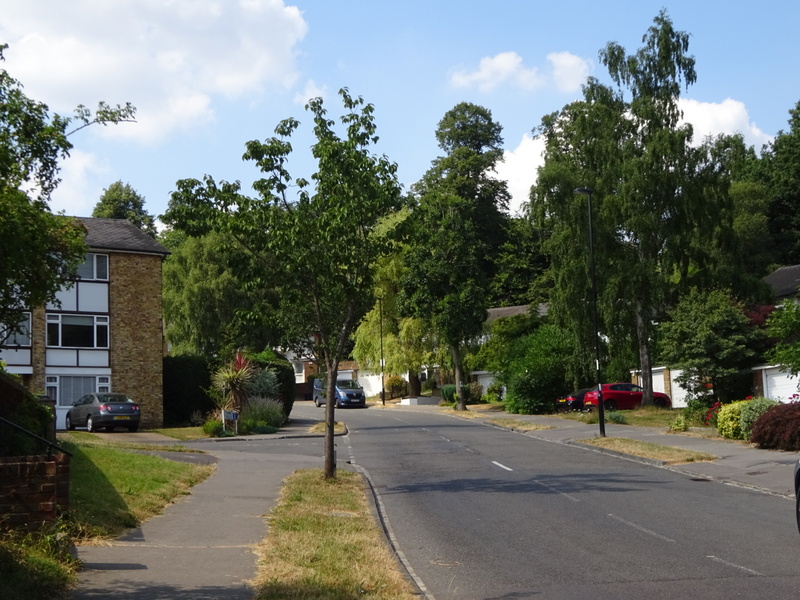 This doubling up of street names is again apparent as the Willmore crosses the main road – the former Kent side is called Beckenham Road, the Surrey side High Street. The stream passes over High Street, crossing next to Tesco. The Willmore still flowed above ground alongside the southerly end of Kent House Road to around the railway bridge at the beginning of the 20th century – see above (source e Bay September 2015). 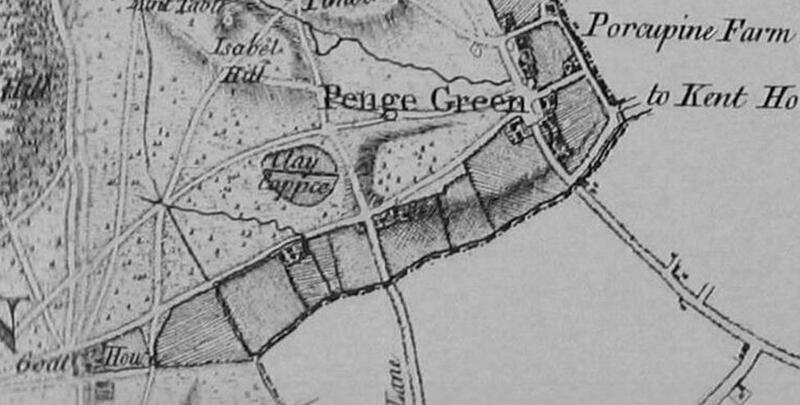 The River was then culverted and joined by Penge Stream, which will be covered in a later post and another, as yet, nameless stream broadly following Parish Lane – this is clear on John Roque’s map of Surrey above. 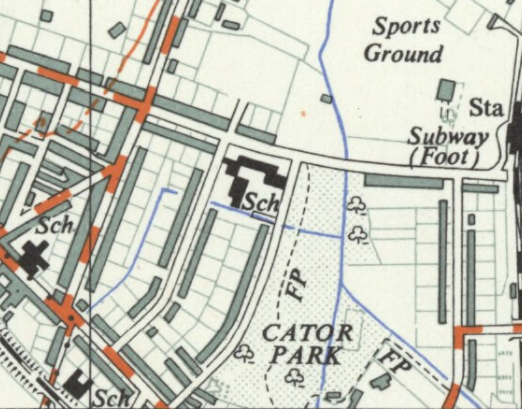 Oddly, until the mid-1960s the newly merged watercourse re-emerged between the gardens of Kent House and Reddons Roads before being forced into a sharp east turn behind the then Cator Park School (now like a school further upstream a Harris Academy) before traversing Cator Park to join the newly formed River Pool (the amalgamated Beck and Chaffinch Brook) . It probably wasn’t the original course but the right angled diversion was probably to make cultivation easier – it certainly existed in the 1860s, before the area was developed. Unlike upstream where culverting was over the top of the existing course, the 1965 works here diverted the flow, presumably under Kings Hall and Aldersmead Roads to enter the Park further south and run parallel to Chaffinch Brook for a hundred metres (the flows clearly audible through vented manhole covers), past the latter’s confluence with The Beck to form the River Pool. The Willmore enters the Pool in the same place as it did before but from a different angle. 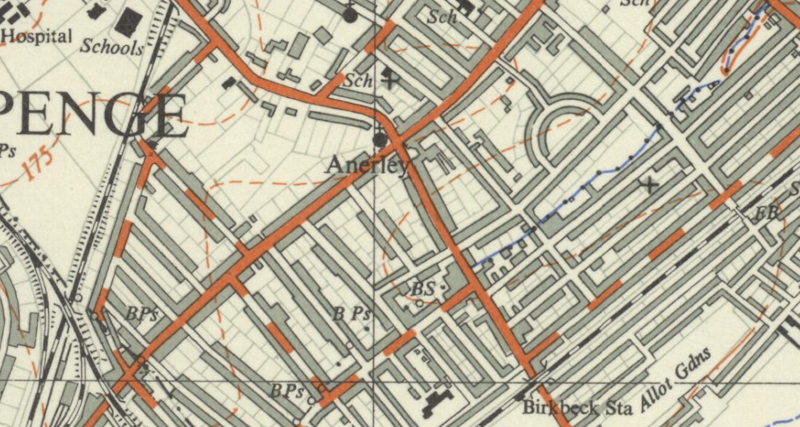 The Ordnance Survey maps images are all on Creative Commons via the National Library of Scotland – the specific links are contained within the text. I cannot remember where I copied a small part of John Roque’s map of Surrey from – it is no longer available on-line in the form that I saw it. If it is your organisation’s image, do let me know and I will properly credit you. 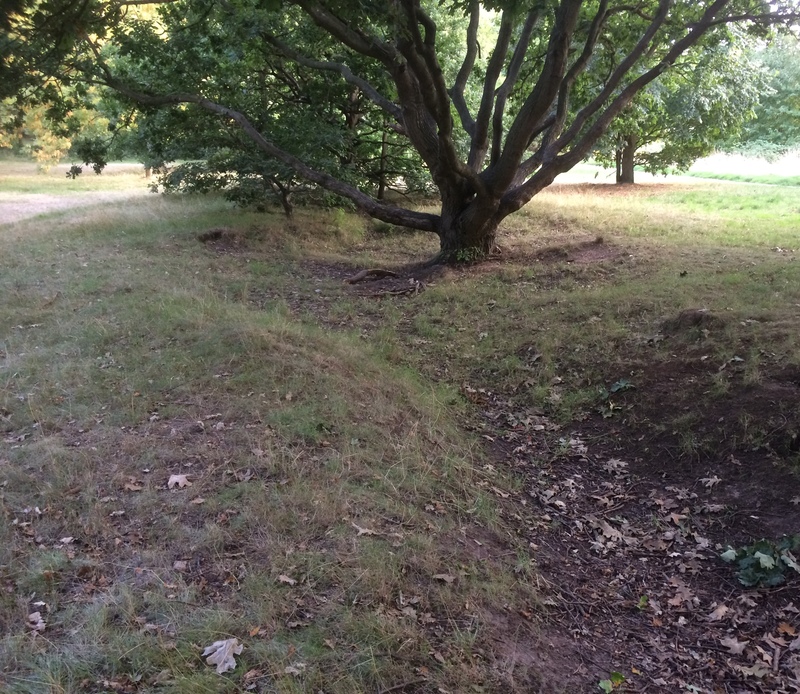 This entry was posted in Bromley History, Rivers and tagged Boundary Ditch, Boundary Stream, Penge, River Pool, River Willmore, Shire Ditch on September 20, 2018 by Paul B.